All 4K 60P recording longer than 10 seconds must be recorded to the new CFast cards. At a blistering 6GB per minute, you'll need a 256GB CFast cards to get roughly 40 minutes of recording time per dive. With the reliability that Delkin offers on all their memory cards, you can be sure that the Delkin CFast 2.0 Memory Card is the best option for amazing 4K video. For embedded platforms which have used CompactFlash as a boot drive or other storage medium, and now face a migration from PATA to SATA due to a processor change, CFast is a logical choice for new designs. CFast has all of the mechanical advantages of CF small, rugged, cased, easily customizable with the added benefits of the SATA interface. CFast is governed by the CompactFlash Association (www.compactflash.org), with mechanical dimensions virtually identical to CF, as the only differences are thickness (3.6mm for CFast vs. 3.3mm for CF) and the 24-pin SATA connector in place of the 50-pin CF connector. Delkin offers a range of industrial temperature CFast capacities in both SLC and MLC flash, to provide the best solution for a given application, whether write intensive requiring high endurance or cost sensitive. 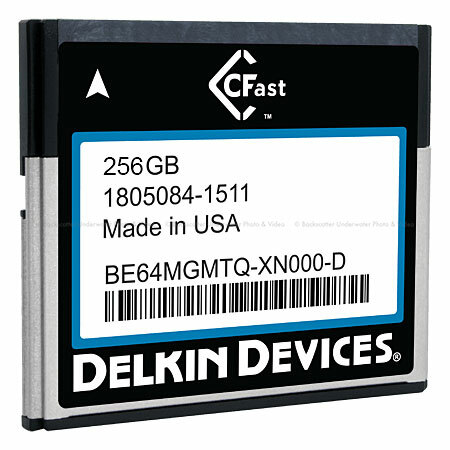 Delkin controls bills of materials down to the flash, controller and firmware version, so once a part number is qualified, the same configuration will be delivered until its EOL date. And recognizing the value of strong life cycle management, Delkin provides advance notification when a part must eventually be discontinued, offering last time buy opportunities and replacement parts for qualification. Delkin also acknowledges that an off-the-shelf part may not always be the best fit, and provides many customization options ranging from custom labels, serialization, content and image loading, conformal coating, custom testing, mechanical ruggedization, even a complete custom design. Contact us to ask how we can customize a drive for your application. Customizable conformal coating, labeling, content loading, additional mechanical ruggedization, etc.